ENVIRONMENTALLY FRIENDLY - We manufactured our cookware products from recycled materials. No heavy metals, chemicals are used in the manufacturing process, Size of the Hascevher Grill Fry Pan: 11 in. x 11 in. Grilling food is always fun and joyous. Whether you want to cook beef, burgers, and breads, this grill frying pan gives your meal a wonderful grilled taste with grill marks without the hassle of starting up the outside grill. The pan unique textured surface (both interior and exterior) has high thermal conductivity that delivers high cooking performance even in low heat; this means you can cook on any heat source (electric, gas, ceramic, or halogen cooktops) and enjoy fast heating to grill your meals. Use our grill pan to grill breakfast foods, fish, sandwiches, steaks, and so much more. Hascevher grill pan is developed to provide the same grilled flavor of any conventional electric or gas grill. It makes the best choice thanks to its versatile design to cook various foods and leave it the way you love it. For many home chefs, this pan minimizes the amount cooking appliances in the kitchen cabinets as well as around the house. 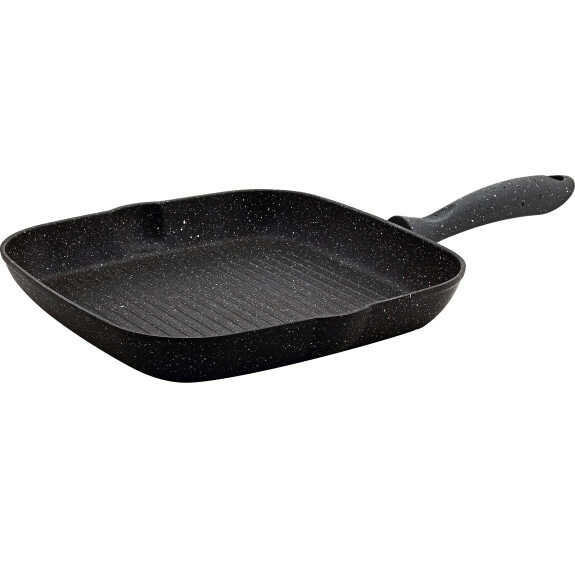 Reinforced using advanced granite coating (PTFE), this grill pan will be resistant to scrapes and scratches from forks, spoons, tongs, and spatulas. What’s more, the surface is nonstick so you don’t have to use fats to grill and cook your meals. It’s easy to clean by tossing it into the dishwasher. Enjoy tastily grilled foods without the need of the bulky gas grill sitting on your patio. Click add to cart and order your Hascevher grill frying pan today!